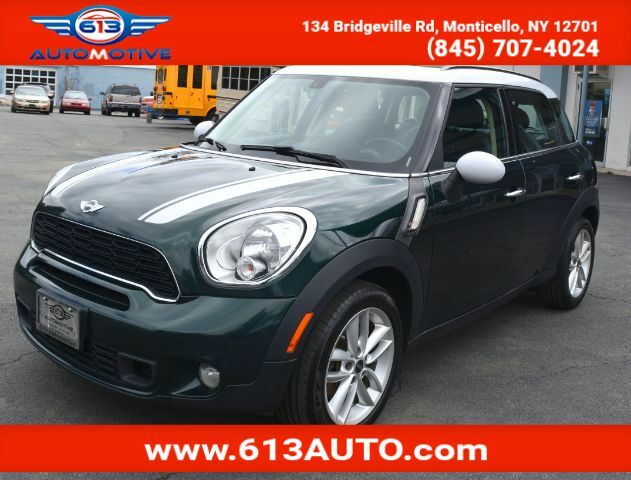 The largest of the Mini family, our great looking 2013 Cooper Countryman S is shown in eye-popping Oxford Green Metallic. Powered by a TurboCharged 1.6 Liter 4 Cylinder that offers 181hp while connected to a responsive 6 Speed Manual gearbox for spirited passing performance. This Front Wheel Drive Cooper rewards you with near 32mpg on the open road as well as a lively ride with fun and pizzazz to spare! The Cooper Countryman S stands out among its peers with funky style and attitude that can be customized to fit any personality. The distinctive style is further enhanced by roof rails, fog lamps, 17-inch alloy wheels and a stance that exudes agility. The surprisingly spacious S Trimm interior offers plenty of sophistication, cargo space and legroom to accommodate even your most discerning passengers. Once you slide into the adjustable leatherette sport seats and take in the vibe of this cabin, you''''''''''''''''ll feel the true spirit that is quintessential Mini. Enjoy such amenities as Bluetooth, a trip computer and a great sound system with satellite radio as you make your way to your next destination. Advanced safety features including anti-lock disc brakes, stability control, front-seat side airbags and side curtain airbags are on board to keep you and your passengers secure and out of harm''''''''''''''''s way. Now is the time to improve your commute with a fun driving experience that balances style, comfort, and whimsy without missing a beat. Print this page and call us Now... We Know You Will Enjoy Your Test Drive Towards Ownership!